#1219208 No cutting room. Made wife sick. Depends on the person. I can cut hottest pods in the world for hours in closed up garage, doesn't bother me at all. If I got in house and cut a nice pungent yellow moruga or similar in half my wife smells it in other room and lets me know about it. Few weeks back put all the cutting boards, knives, chopper, etc in dishwasher, and rest of family was coughing like crazy while in kitchen. It had no smell but must have been some fumes of capsaicin coming out. It all depends on the person, but typically non Chile heads have very little tolerance for the fumes also. Yeah, I never have issues unless I'm directly over some cooking superhots and even then I'm usually just sneezing or coughing. Question about cutting boards.. do you guys like using wood or plastic? I have a plastic board that I like to use for meats since I can toss it in the dishwasher to sanitize it. I was thinking that's probably the move for pepper prep also since I was thinking the capsaicin may leach into my good wooden boards over time. #1219197 No cutting room. Made wife sick. So I'm a bit of a noob with processing but I was thinking of drying a good portion of my stuff this season. Are the fumes really that bad? I live and grow in a large studio apartment (I have floor to ceiling windows facing south all along one wall that are great for growing). Will my apartment become uninhabitable? Am I going to have my neighbors busting down my doors cause I've pepper sprayed my whole floor? 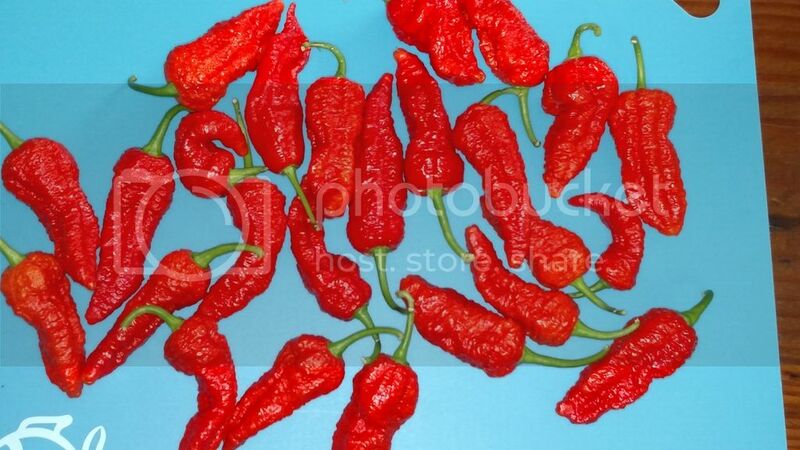 Those bhutlahs are sick. Very nice looking pods all around. My first significant pull from these. Hope to finally try one this week. Did you have a chance to try 1 yet? Very interested in the flavor profile as I'm thinking about adding them next season. Received my order from pepperlover.. all the positive revues are justified. Not only did I receive the 7 varieties I ordered, but I also received 2 varieties that I will def be trying as well. Also.. Pepperlover easily sends twice.. maybe even 3x the seed count that other vendors send. Judy will probably be my default seed vendor going forward. *edit* also.. i feel like i id'ed most of the peppers myself well.. but what are the little yellow guys? they have a legit bite and tasty flavor! Posted by QuatroCrazy on 05 August 2015 - 10:19 AM in Welcome! Posted by QuatroCrazy on 04 August 2015 - 02:00 PM in Welcome! I've been a lurker for several months and this website has been such a tremendous resource. This has been my first season. I'm currently growing orange Habs, Scotch bonnets, Trinidad Moruga Scorpions, Naga Vipers, and Prik Chi Faa varieties. I grow indoors in my apartment.. I have about 18ft worth of south facing windows and I've also converted half my walk-in closet to a grow room. My main plants are in bottom feeding 5g buckets (I alternate waterings top/bottom every other and they work awesome!!) I also have a few 2 gallon buckets going also. Thank you all for the wealth of knowledge here. You guys are great!